I’ve never had a huge amount of seafood in my diet – the occasional prawn, a drunken filet-of-fish from time to time, but these are few and far between. Feeling like it’s about time I shake things up I decided to give this a go. 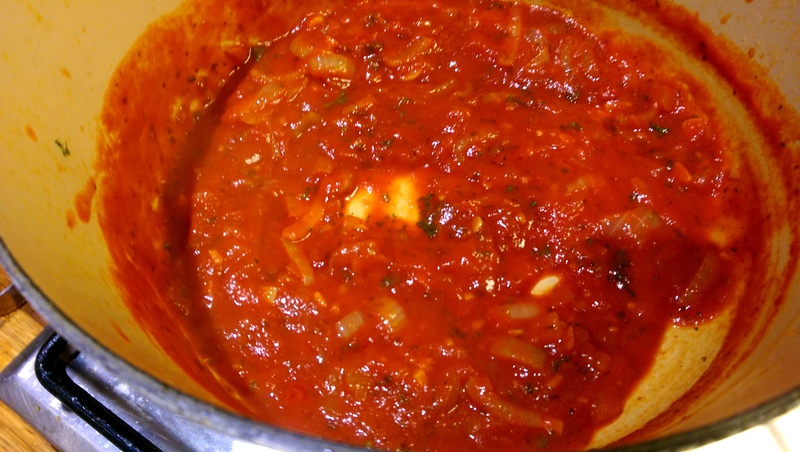 I’ve seen a few recipes out there in which the feta is incorporated into the tomato sauce itself, providing a stronger creamier tomato sauce. While this is no doubt enjoyable, I think the contrast between rich tangy tomato sauce and a cooler, clearer influence of a separate sauce offer a far more interesting mouthful. Given that this was the first time I’d tried this I was a little nervous, but I’m thrilled to say it turned out perfectly, a definite addition to my regular roster. I used smoked cod, hence the yellow hue. I’m a big fan of smoky flavours, but if that’s not for you I’m certain this would work well with unsmoked cod. 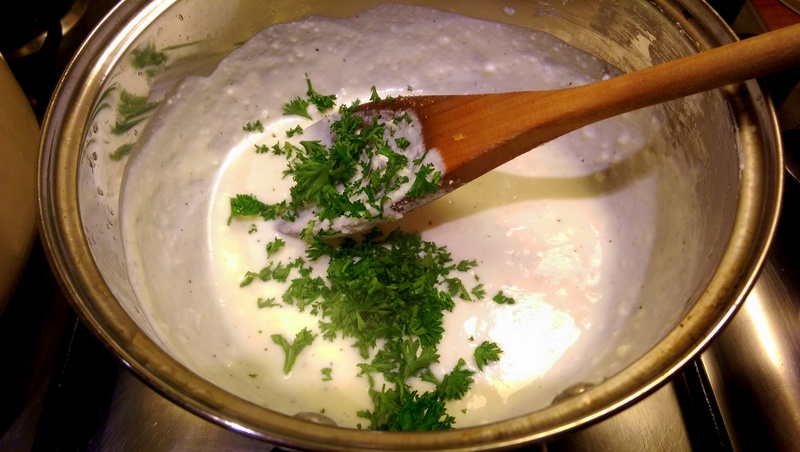 Mediterranean herbs – basil/parsley etc. 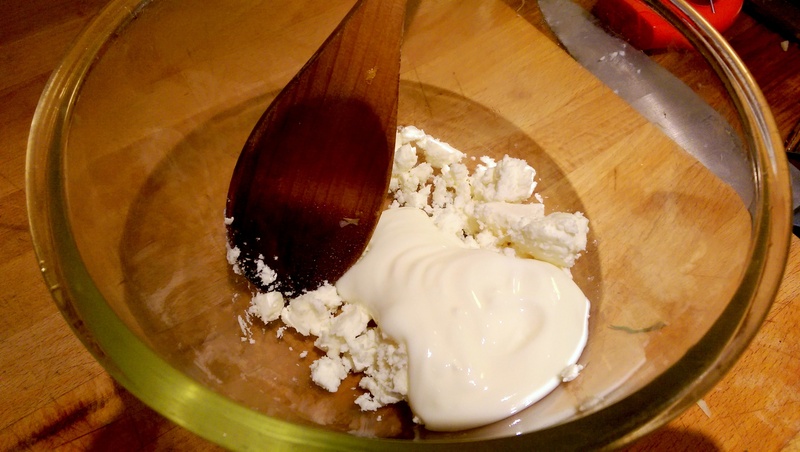 Crumble a handful of feta into a bowl and crush with the back of a spoon. Add a spoonful or two of greek yoghurt and stir well. the yoghurt. Add a little lemon juice, seasoning and parsley. 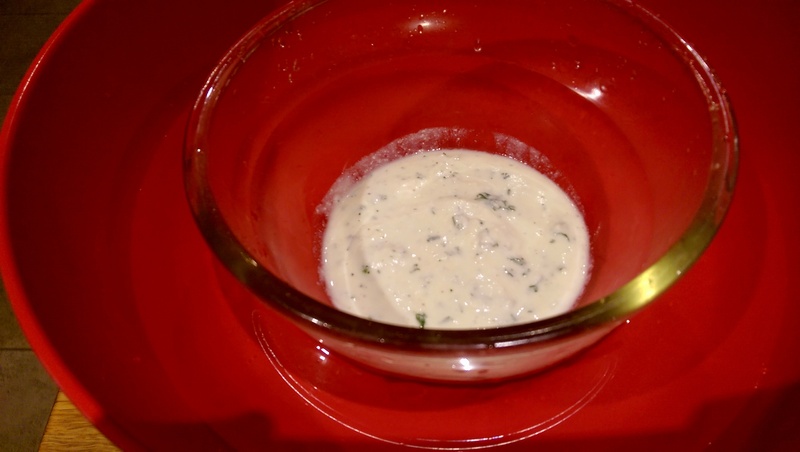 When the feta has melted sufficiently, return the mixture to the bowl and surround it with cold water/put in the fridge. You want this to be cool and thick for the finished dish. 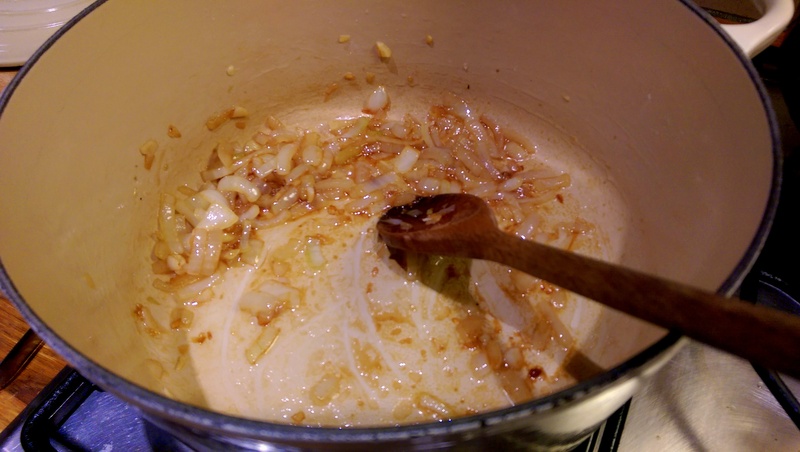 Heat some oil in a wide-based saucepan and add the onion, frying for a few minutes until beginning to turn golden. Add the garlic and any other mediterranean vegetables you may be using and fry for a few more minutes. Pour in the passata/chopped tomatoes and a sprinkling of sugar to take off the bitter, tart edge of the tomatoes. Add any herbs and season to taste, simmering for a few minutes to help it thicken. Gently place the cod into the pan so that it is half submerged, turn the heat to medium and place the lid on the saucepan. Leave it closed for 7-10 minutes. The fish will be cooked by the liquid and steamed from above. Be careful not to leave it too long or the tomato sauce will burn. When the fish is flaky and a solid colour (as opposed to the uncooked, slight shiny translucence – this shouldn’t take more than 7 minutes), carefully remove it, supporting its weight so it doesn’t break apart. 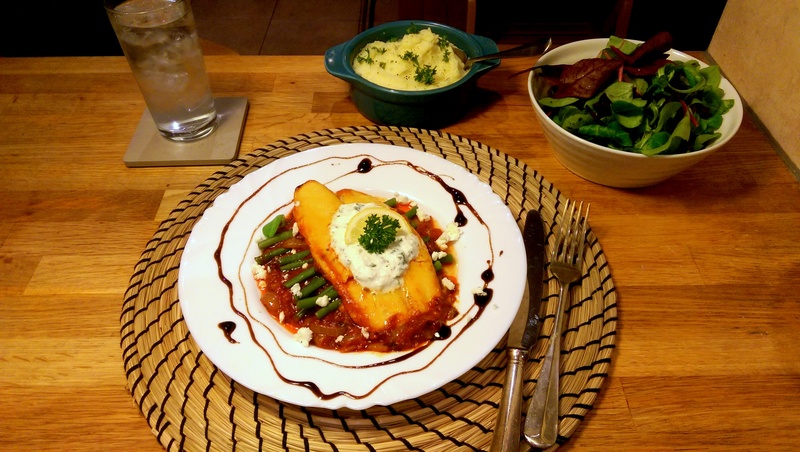 I decided to serve it as layered dish, with the tomato below the fish and the feta above (with green beans to boot). This just helps keep those elements separate even on the fork so that they don’t mix into an orange mess. Some crumbled feta, balsamic glaze and lemon wedge completed the plate, with a delicious side of herby mash. Again, I was so happy with how this turned out, I couldn’t recommend it more! 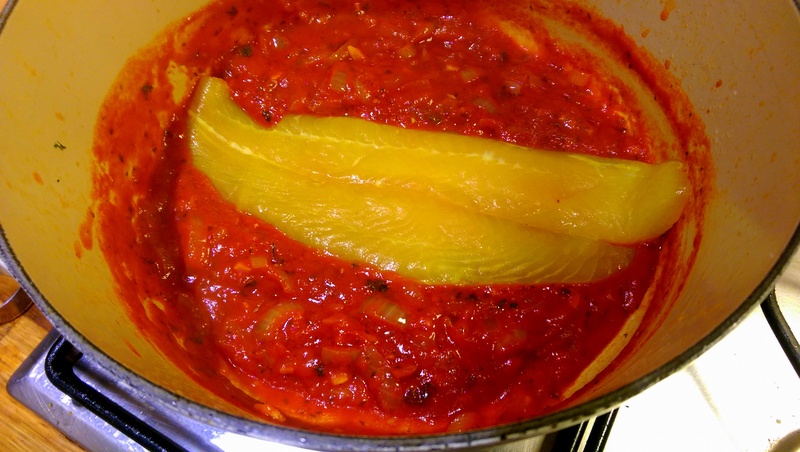 Posted in Fish, Guesscipes, Mains, SaucesTagged cod, feta, fish, food, gourmet, greek, guesscipe, healthy, mediterranean, pescatarian, poached, recipe, smoked, steamed, tomato, vegetables, yoghurtBookmark the permalink.